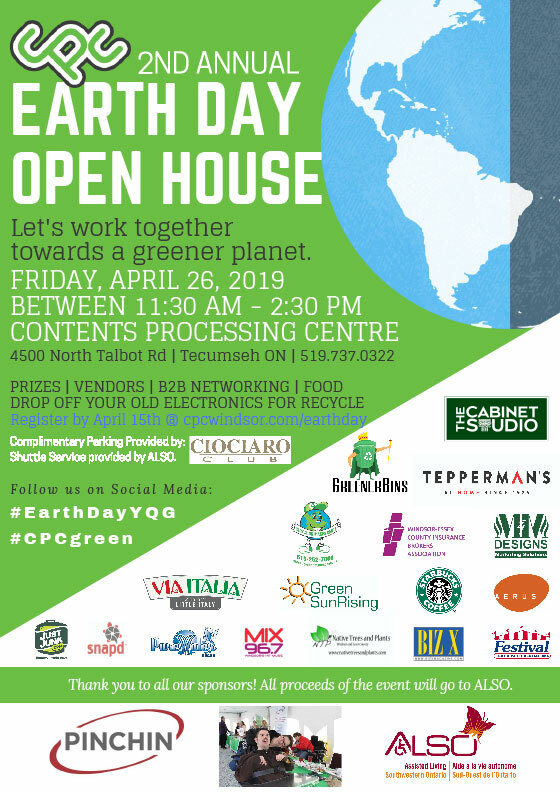 Contents Processing Centre inviting you to our 2nd Annual Earth Day Celebration! Presented by PINCHIN in support of Assisted Living Southwestern Ontario. Our goal is to educate the public on how CPC can help you clean and restore all your personal or business items from photos, documents, tools, electronics and more. Processing contents in the context of an insurance claim involves many working pieces which can often lead to unnecessary waste and costs if mishandled. Our proven methods minimize the impact on the environment by recovering a very high percentage of affected items; Keeping them away from landfills and returning them to the customer in good order. Join us on Friday, April 26th between 11:30 am – 2:30 pm to see how you can do your part in helping preserve our environment. Register by April 15th for a complimentary lunch and a chance to win some great door prizes. For more information please contact Elizabeth@cpcwindsor.com or call 519-737-0322.